Ahmed is 30yrs old, from Iran, and has been in Calais for a month with his younger brother. He is a boxing champion but in that month in Calais his weight has dropped from 120 kilos to 95 kilos. He proudly showed us several ‘one handed’ press ups but said he can no longer train because of the lack of nutrition and the fear of smelling of sweat because there are no showering or washing facilities. Ahmed showed us a picture of his Mom on his mobile but said he resists calling her because all they do is cry. 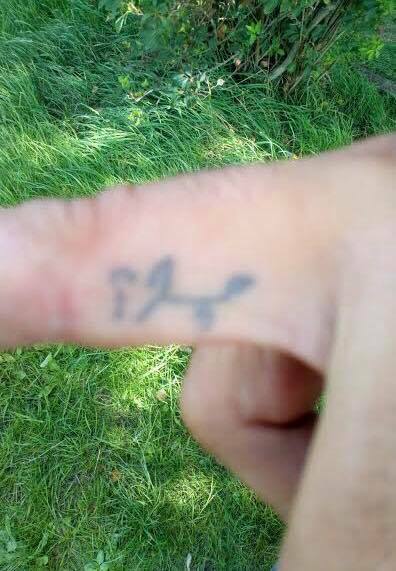 I noticed a small Farsi word tattooed on the inside of his right middle finger (I’m hoping that photo is attached). I asked him what it was. He explained; he is a christian and as a result the police would arrest him, shackle him and violate him. Upon his release Ahmed would look to the heavens and exclaim “WHY” – this tattoo is the Farsi word for “why”. In due course I am going to have the same tattoo as a reminder but also in homage and hope for Ahmed, his brother and the many others who wrongly suffer. “WHY” such a tiny word but such a huge and meaningful statement.